Zinc hotlines make it easy for people in the field to get help from an expert, check in with their dispatcher, or collaborate with a partner. Zinc 5.10 includes a number of improvements that make it easier for teams to use hotlines. For an introduction to hotlines see this article. When someone reaches out to a hotline you have joined, you will see a card for the request pinned at the top of the Conversations list in your Zinc app. Each new request sent to a hotline you are in (also known as "staffing" a hotline) will appear at the top of the Conversations list. You no longer need to click into a hotline group to see all the recent new requests. Requests from all of the hotlines you staff are shown together in one list. If you staff multiple hotlines, you no longer need to click into each individual hotline group to answer new requests. Requests are ordered based on how long the person has been waiting for help. Requests where the person has been waiting the longest are shown at the top of the list. If someone else in your hotline claims a request it will be removed from the list at the top of Conversations. Now you can join a request conversation with a single click. You no longer have to confirm that you want to join the conversation. There are no changes in how you access and interact with request conversations that you are already a member of. When you are done with the request, click done. The request will be marked done and you and any other staffers will be removed from the request conversation. The messages posted by the bot will continue to have the text of the message sent to the hotline and a link that lets you join the request conversation. You can continue to use these links to access both past requests and current in-progress requests. Why doesn’t my hotline group jump to the top of the Conversations list every time someone sends a request to the hotline? 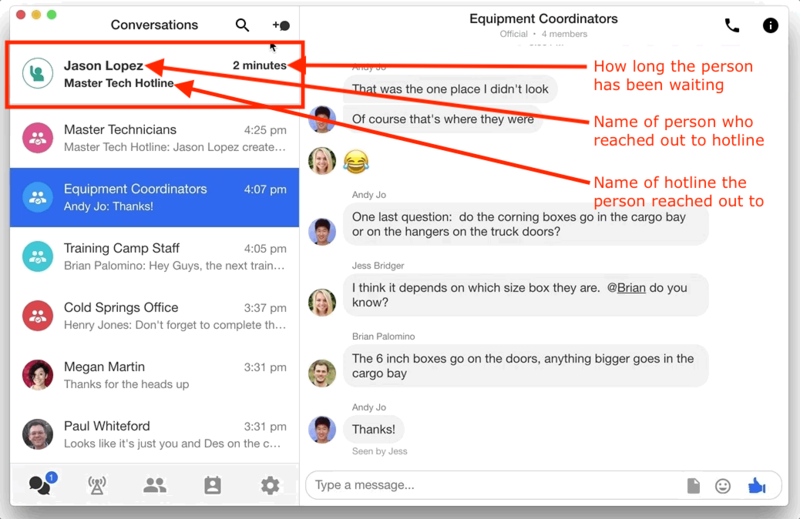 Since Zinc now shows the request at the top of the Conversations list, the app no longer puts the hotline group conversation itself at the top of the list. The bot still forwards the request message to the hotline group, but it does not make the conversation unread. Do I join a hotline the same way? I can see 5 requests in my request feed, but the hotline bot tells the requester that I’m working on only 3 requests? Currently hotline bots are only aware of the requests that have been sent to their hotline. As a result, bots will reply to requesters with the number of pending requests in their hotline. This means that if you are a member of multiple hotlines and have open or pending requests in more than one of them, the bot might give the requester a different number than the actual number of requests that you are working on. How can I see a request that has been marked done? Why don't I see requests more than 24 hours old in my requests list? Currently, Zinc will only show open requests in the requests list that were sent within the past 24 hours. You can still access older requests by going to the hotline group conversation and clicking on the link sent by the hotline bot.